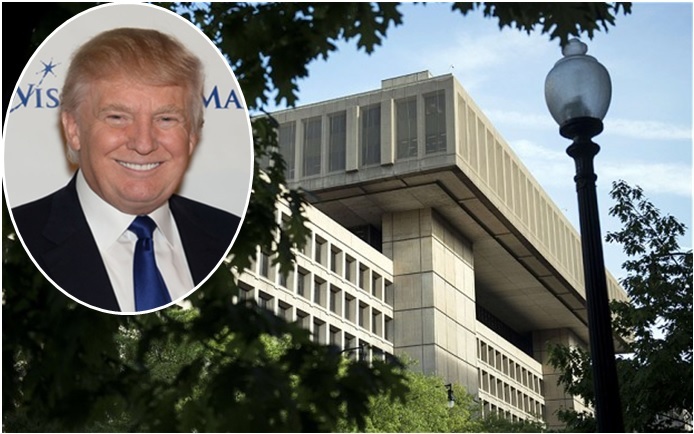 Flamboyant New York property developer and reality TV star Donald Trump is casting his eye on what some Washingtonians consider an architectural eyesore in the US capital - FBI headquarters. He told The Washington Post in an interview posted online that he might take an opportunity to acquire the Brutalist-style premises on Pennsylvania Avenue in return for erecting a new and bigger home for the storied federal law enforcement agency. "We'll be watching the FBI as to what's going to happen," the Post quoted Trump as saying. "Whether or not we will bid on it, we may, we may not." Inaugurated in the mid-1970s, the 11-floor J. Edgar Hoover Building houses more than half of the 10,000 employees of the Federal Bureau of Investigation in the greater Washington area. But while it sits on a prime chunk of real estate, halfway between the Capitol and the White House, it is suffering from structural decay and overcrowding. Critics insist it won't be missed, contending its blockhouse style is a blemish on an otherwise grand boulevard, although others argue it should be preserved as a historic site. Trump's interest is piqued by his 60-year lease he's taken out across Pennsylvania Avenue on the stately Old Post Office, built in 1899, which he plans to turn into a 271-room luxury hotel with the biggest ballroom in town. That project, which Trump is putting together with his daughter Ivanka, is expected to cost more than $200 million, the Post reported. "Friends of mine, they spend these ridiculous amounts of money on paintings. I'd rather do jobs like this," said Trump, host of his own reality TV series "The Apprentice." The General Services Administration, which oversees federal buildings, has yet to decide where a new FBI headquarters should go up, but it favours a "building swap" whereby the developer of the new premises - possibly in the Washington suburbs - would get the old one in payment.